The NutriChef PKWK53 is an elegantly designed Stainless Steel Electric Water Kettle that looks great whether serving or simply sitting on any kitchen or countertops. Enables you to enjoy a vast variety of coffee and tea. With a large water capacity of 3.69 quarts, easy to use and a very affordable. QUICK HEATER: The cordless electric kettle boils water and keeps liquids hot with a built-in food grade stainless steel inner pot and selectable temperature control setting. At 730 watts, the electric tea kettle boils water quickly. 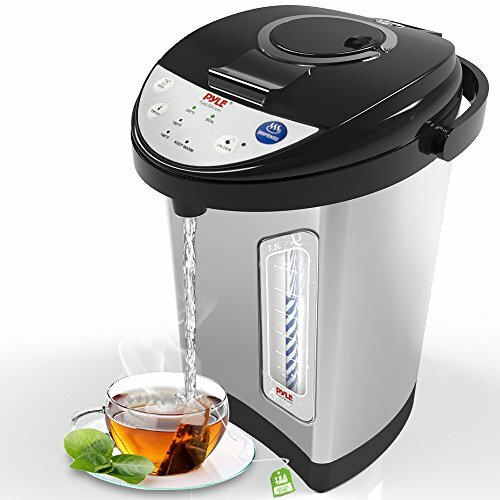 SIMPLE PLUG-IN OPERATION: The kettle electric features a convenient power cord, as well as an auto power off function, LED illuminated power indicator and a child safety lock-on lid. COMPACT TABLETOP DESIGN: The electric water kettle is safe for placement on any kitchen table or countertop, making it suitable for anytime use. Entertain your guests or pour yourself a coffee or tea with ease style. ADJUSTABLE TEMPERATURE: The electric tea kettle features an adjustable temperature setting range of 140 - 208 degrees Fahrenheit. Vacuum insulation keeps water warm, longer. GOOD FOR ENTERTAINING: The electrical water boiler features a multi-dispense ability, with three modes including auto, button and pump. The button-activated water dispense function makes entertaining and catering to your guest's needs easier than ever.